Ms. Sinoun and her neighbor help their children do experiments with insects. "I never used to play with my young children and help them learn like those parents do in the show. After watching Peep several times with my children at my neighbor's house, I realized that Peep is a very good show that helps all children become clever and curious. I am so impressed that Cambodia has this kind of TV show for children and parents." For thousands of Cambodian parents, like 30 year-old Chay Sinoun, interacting with their young children was not considered an educational opportunity. Raising her children by herself, Sinoun describes how tough her life can be, often eking out a living by searching in the forest for mushrooms and bamboo shoots. With that kind of pressure, she found it difficult to find time to interact with her children, much less play with or teach them. However, in mid 2008, Sinoun was introduced to discovery learning play activities for children at a parenting meeting organized in her village by the District Office of Education. She was also told about the new show Peep and the Big Wide World that aired each Sunday. At first, she admits, she felt the show and the parenting education meetings were a waste of her time and that working in the forest was far more helpful for her family. Unexpectedly, however, she started to enjoy both the parenting meetings and the show. She has learned a lot, she says, about how to interact with children, and she has seen activities that were more interesting than any she had seen before. 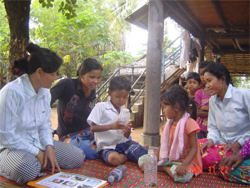 Over time, Sinoun started to try out some of these discovery learning play activities with her children, using water, insects, and shapes. She talks about how she has changed. "I don't think it is a waste of my time now because I can teach my children through our daily activities such as going to the forest, market, school and rice field, cooking, washing, and so on. I rarely spent much time with my young children because I thought I had nothing to teach them, yet now I spend time with them to help them learn and ask them questions while we are cooking, washing clothes, having a bath, or while we are on our way to the forest, market, or field." Sinoun also notes some subtle changes in the way she interacts with her children. "It was really difficult for me after just seeing one episode. Yet, having seen the show a number of times, I am now able to ask my children to describe, compare, and make predictions and conclusions. I always told my children the answers in the past, but now I ask my children questions or prompt them when I want to hear the answers from them," she says. Commenting on how her children have also changed Sinoun says, "In the past, I noticed that my children were shy and didn't dare to express their ideas among their peers. Yet now they feel brave enough and are very curious." Summing up her experience, Sinoun explains, "Peep has encouraged me to be more responsible towards my children's future. I am really excited to see my children learn and play with objects around my house. I am really proud to see my children ask me a lot of questions and experiment with colored water, insects, shapes, and plants like Peep and his friends do in the show."